Pilots of the 332nd Fighter Group are briefed for a mission, probably photo-reconnaissance, given the size of the assembly. 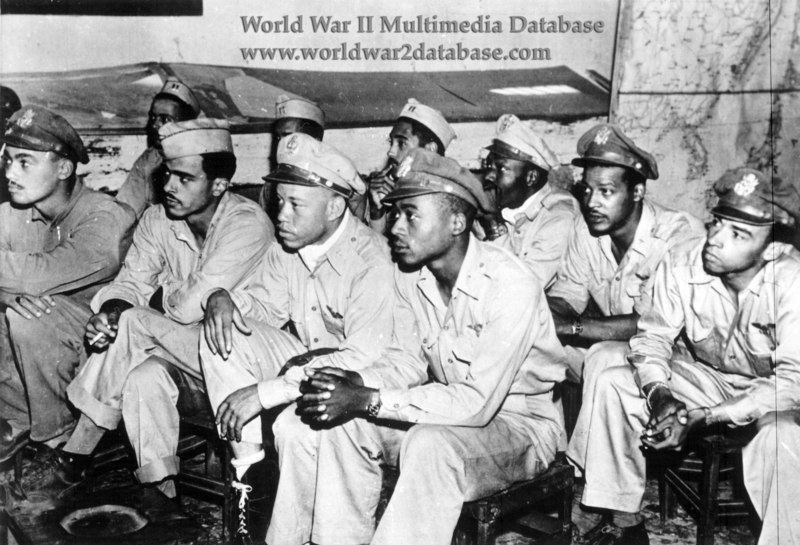 The 332nd was formed in October 1942 in Tuskegee, Alabama, of African-Americans from the Tuskegee Institute. All the pilot cadets had college degrees and faced much tougher qualifications than whites. At first the unit consisted of the 100th, 301st and 302nd fighter squadrons; later the independent 99th fighter squadron was added. The 332nd joined combat in February 1944. Like the 99th, the 33nd was commanded by Colonel (later four-star General) Benjamin Oliver Davis. Almost as strong as the Axis opponents were officers of the United States Army Air Forces who bitterly opposed the concept of African-Americans in combat. At first the 332nd trained and fought with obsolete Bell P-39 Airacobra and Curtiss P-40 Warhawks; later they fought briefly with the Republic P-47 Thunderbolt (April-May 1944) and then with the North American P-51 Mustang, which they painted distinctive red on the tail surfaces, resulting in the name "red tails." The 332nd was credited with 109 aircraft destroyed in the air; German destroyer TA-27 sunk; and 15,000 sorties in 1,500 missions. 992 Tuskegee Airmen graduated; 445 were deployed overseas; 150 were killed in action or training accidents.